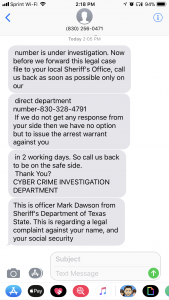 [UPDATED 7/18/18 BELOW] On April 26, 2017 we received 2 screenshots from a woman, we’ll call Carrie, who had just been contacted via text by someone claiming to be Officer Rickey Clarke from the Cyber Crime Investigation Department of Texas State. Carrie, it appears, was in big trouble and had a “legal complaint” filed against her. Carrie was instructed to call Officer Clarke back at his number, 830-326-4237. Thankfully, Carrie was savvy enough to see through this scam and sent us screenshots of the texts. However, we were curious and wanted to see what would happen if we called “Officer Clarke.” When we called, a man with a slight southern accent answered the phone with “cyber crime investigation department, how may I help you.” After we gave a name, the man asked us if we received a text on the phone we were calling from at that moment. Then he asked us to hold and we waited 30 seconds before he came back to say that he had no record of our number and asked for the number of the phone that received the text. We asked him if we were speaking to an officer in Texas. He replied with “this is the Wayland County Sheriff’s Office, Texas.” We asked him to confirm again, as if it were hard to hear him and he repeated the same information, after which we ended the call. Some things did not add up…. Google shows Officer Clarke’s phone number as being associated with Dilley, Texas. Not Wayland, Texas. Dilley, Texas, according to Google, is about a 5 hour, 20 drive south of Wayland and has a population less than about 4000 people. Officer Clarke said he represented “Wayland County Sheriff’s Office.” We cannot find a county named Wayland county in Texas (using Google), though we do find Wayland, Texas located west of Dallas. Both Dilley, Texas and Wayland, Texas are tiny towns. Why would such small towns in Texas have their own Cyber Crime Investigation units when it appeared to us (using Google) that their police department couldn’t be more than 5 people each. We decided to contact the Police Department in Wayland, Texas and actually couldn’t locate that information because the Department office is so small and doesn’t have it’s own website. We contacted the police in nearby Breckenridge, Texas and explained to an officer in Brechenridge what had happened and why we were trying to reach the Wayland Police. She gave us the name of the Wayland Sheriff and his phone number and we placed the call. The Wayland Sheriff knew nothing about a Cyber Crime Investigation unit for his town, nor any officer named Rickey Clarke. We gave him all the information, including Mr. Clarke’s phone number. He thanked us and said he would look into it. On August 3, 2017, we received an email from a TDS reader. She was contacted about this scam via the following email. Notice that it came from a Gmail account, not a real police department of government account. Also, many people online have been complaining about scam calls from the phone number provided in the email, such as these on 800notes.com. 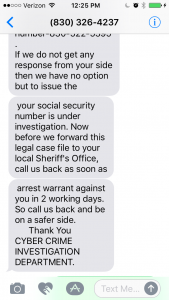 against your name, and your social security number is under investigation. Now before we forward this legal case file to your local Sheriff’s Office call us back as soon as possible only on our direct department number-830-310-6921. but to issue the arrest warrant against you in 2 working days. So call us back to be on the safe side. 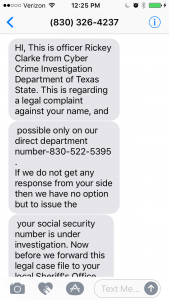 A number of people on 800Notes.com are complaining about these texts and the 830-582-8782 phone number you are asked to call. Complete fraud! Looking for a good deal online for a new or used laptop? Don’t buy one from these websites! On November 8, 2017 a TDS reader sent us this text she received. 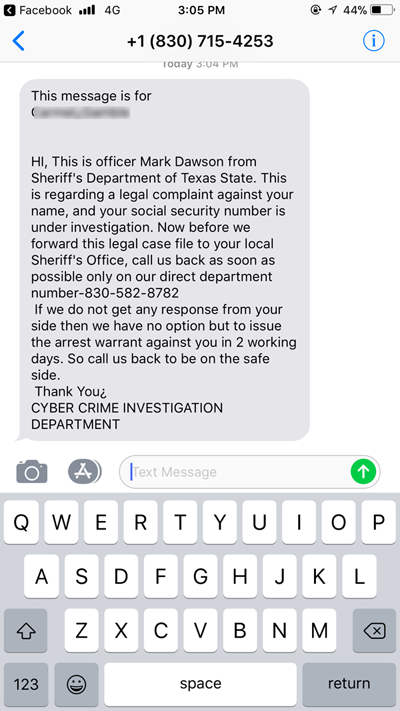 Looks like “Officer Dawson” is still at this scam. He hasn’t even changed his phone number yet! This is officer Mark Dawson from Sheriff’s Department of Texas State. 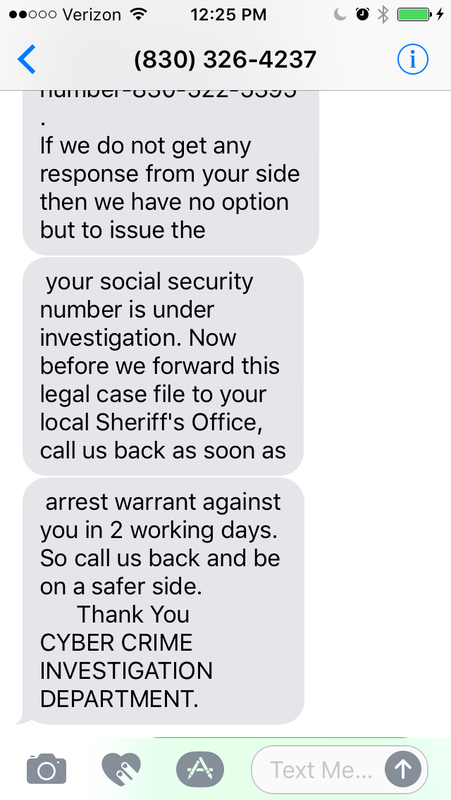 This is regarding a forward this legal case file to your local Sheriff’s Office, call us back as soon as possible only on our direct department number-830-582-8782. If we do not get any response from your side then we have no option but to issue the arrest warrant against you in 2 working days. So call us back to be on the safe side. We found someone else reporting a scam from this phone number. Visit 800notes.com and drop down to August 17. 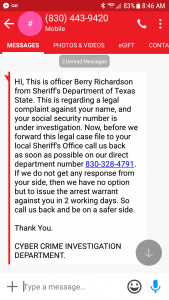 “Hi, This is officer Berry Richardson from Sheriff’s Department of Texas State. This is regarding a legal complaint against your name, and your social security number is under investigation. Now, before we forward this legal case file to your local Sheriff’s Office call us back as soon as possible on our direct department number 830-328-4791. If we do not hear get any response from your side, then we have no option against but to issue an arrest warrant against you in 2 working days. So call us back and be on the safer side. 2 Working days? Like 2 days that work for me? I’m pretty busy so it might be a while before I have 2 days that work for me. If we do not get any response from your side then we have no option but to issue the arrest warrant against you in 2 working days. So call us back to be on the safe side. There seems to be a new variation of the cyber crime investigation scam and it is coming from a scammer in Surat, India! A TDS reader sent us this text she received today, along with her response. The scammer wanted her to contact the FTC Law Department using the email ftc.lawdept “@” gmail.com. 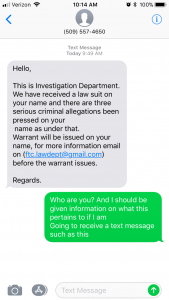 This Legal Proceedings issued on you Docket no: MC-48509 with one of American Cash Loan Company in order to notify you that after making calls to you on your phone number we were not able to get hold of you. So the accounts department of Cash Advance has decided to mark this case as a flat refusal and press legal charges against you. We have sent you this warning notification about legal proceedings on November 2, 2015 but you failed to respond on time now it’s high time if you failed to respond in next 24 HOURS we will register this case in court. Consider this as a final warning. And we will be Emailing/ Fax this issue to your current employer to make sure they take strict actions against you. Your salary and all your wages confiscated. Advance, Rapid Cash, Sonic Payday, Speedy Cash, My Cash Now, National Payday, Paycheck Today, Payday OK, Cash Central Loans, Cash Net 500,Cash Net USA, Allied Cash, Super Pawn, Check into Cash, Check Smart, Cash America Net, Cash America, Cash America Pawn, Cash land, Super Pawn, Cash America Payday Advance, or any company-owned Mr. Payroll locations. “You” or “Your” means you as a participant in or as a user of the products and/or services offered by a Cash Advance Related Company. We believe that this was not your intent and that these steps are unnecessary. We merely require you to contact our recovery asset location department at account:- (FTC.lawdept “@” gmail.com) from 9.30 to 6.30 (EST). Confidentiality Statement & Notice: This email is covered by the Electronic Communications Privacy Act, 18 U.S.C. 2510-2521 and intended only for the use of the individual or entity to which it is addressed. Any review, re-transmission, dissemination to unauthorized persons or other use of the original message and any attachments is strictly prohibited. If you received this electronic transmission in error. please reply to the above-referenced sender about the error and permanently delete this message. Thank you for your Co-operation. We immediately responded to “Mr. Martin” explaining that we always pay our loans and, as proof, sent him a link to our loan account. The link was just a tracking analytic. Ten minutes later we learned that Mr. Rick Martin of the FTC Law Department was located in Surat, India. According to Google, Surat is a large city beside the Tapi River in the west Indian state of Gujarat. “Once known for silk weaving, Surat remains a commercial center for textiles, and the New Textile Market area is lined with fabric shops.” We wonder if Mr. Martin can get us a good deal on a new throw rug! UPDATE: We hear from so many people who get this scam! 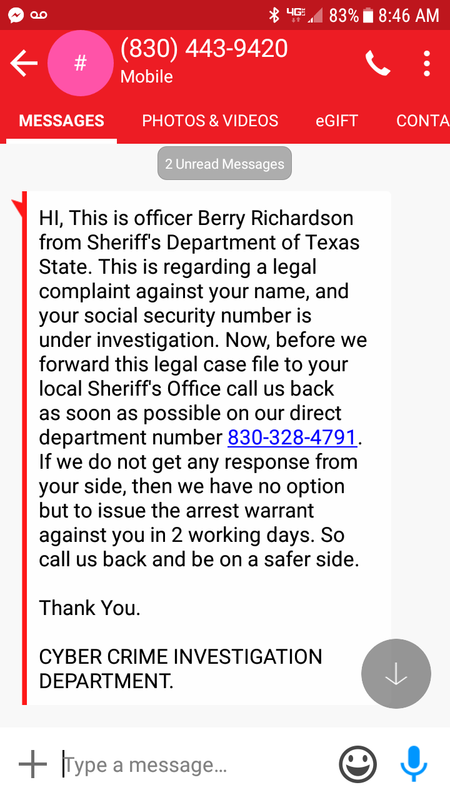 We will post new phone numbers used by these scammers below.“HI, This is officer Berry Richardson from Sheriff’s Department of Texas State. 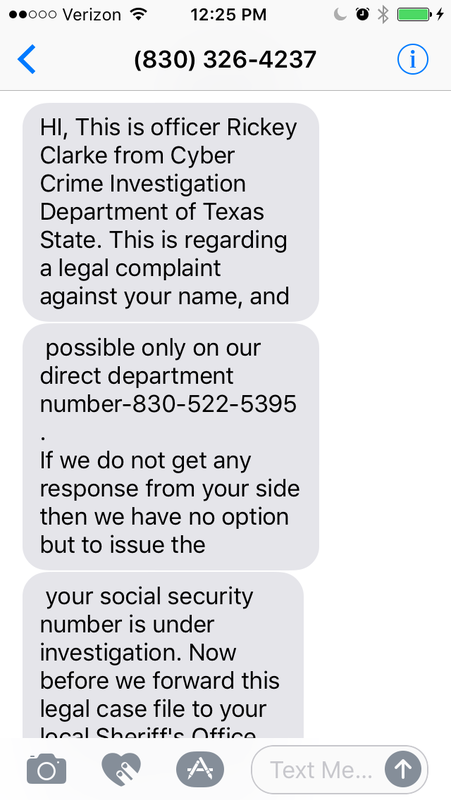 This is regarding a legal complaint against your name, and your social security number is under investigation. 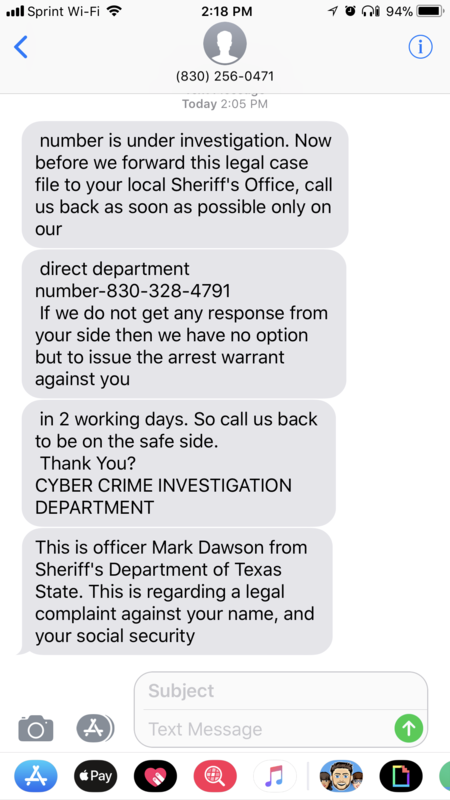 Now, before we forward this legal case file to your local Sheriff’s Office call us back as soon as possible on our direct department number 830-321-4059.If we do not get any response from your side, then we have no option but to issue the arrest warrant against you in 2 working days. So call us back and be on a safer side.